Crusaders goalkeeper Sean O'Neill. Pic by Pacemaker. Goalkeeper Sean O’Neill has submitted a transfer request to Crusaders. The experienced number one, now 30 years old, will be aiming for a move in the January transfer window. 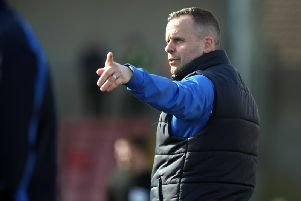 Crusaders confirmed the news over social media and stated that manager “Stephen Baxter has reluctantly agreed to the request” and the club will “now listen to offers for Sean”. The decision comes around 24 hours after the defending Danske Bank Premiership champions announced the signing of former Derry City goalkeeper Gerard Doherty.